Looking to keep your food hot and fresh? 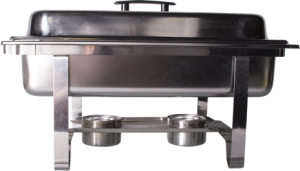 Rent our chafing dishes which include two 3-4 hour sterno chafing fuel burners per rental. Extra sternos are available for purchase to ensure your food stays hot as long as you need. Whether you are tossing a salad or preparing punch, we have Punch bowls, salad bowls or vegetable bowls in stainless steel, ceramic or glass to give you a one stop party rental experience. Our series of trays and platters are perfect for serving desserts, sandwiches or beverages. We’ve got a wide range available to make sure you’re covered, whether you’re looking for a simple non-stick bar tray or a more elegant stainless steel tray to display your perfectly cooked roast. Explore our tray and platter inventory to find what will fit the look of your event flawlessly.